Mountain Oak Vapors to the Rescue! You’ve probably noticed that several eLiquid vendors have started to carry more hardware then they used to, and our great friends at Mountain Oak Vapors have been steadily building an inventory of specific, highly desired and highly targeted products. 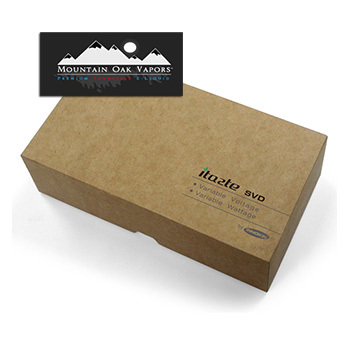 Because of the hard time I was having finding even one iTaste SVD I happened it mention to the owner of Mountain Oak Vapors and he told me he stocked it and would be more than happy to send one out. A couple of days later it arrived. 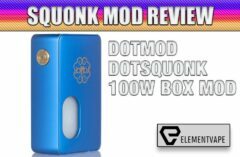 Now I can finally deliver our review on this much talked about, much hyped APV thanks to Mountain Oak Vapors. So the next time you find yourself picking out eLiquids at Mountain Oak Vapors make sure to stop by their hardware section. I think you’ll be delighted to see what they offer. The pricing is excellent and the stock levels are generous. The SVD starter kit sells for $99, the same price as the biggest vendors. As of today (May 14th, 2013) there are 33 left in stock. 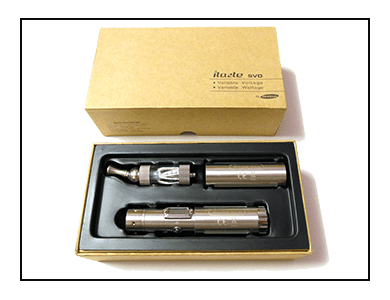 I must admit I had some preconceptions about the iTaste SVD, which by the way stands for “Superior Vaping Device”, and they all turned out to be wrong. To my surprise the SVD is a telescopic APV. I did not expect that. Because it is telescopic it can handle three different batteries: (use IMR types) the 18350, 18500, and 18650. It is 510 and eGo threaded as well, giving you a lot of options for size, weight, and eLiquid delivery. Without a doubt, it scores highly in the versatility department. It is also thicker than I expected, especially since I didn’t expect a telescopic device. Even with the 18350 (smallest) battery installed it is a tad heavier than I imagined it would be, and with the 18650 battery and SVD extension tube it’s quite a hefty setup, and rather tall. Add an iClear 30 to it and you have something very substantial indeed. In addition, it is a stainless steel device, head to toe, which adds to the heftiness factor. Still, it never felt too heavy, and it is a very evenly distributed weight so it never felt clumsy. It feels sturdy, professional, clean, and valuable. After my initial disappointment with the iClear 30 (I had about the same experience with it as Tom did), I half expected to be disappointed in the SVD. I wasn’t. Speaking of adjustments, the iTaste SVD uses the plus/minus/fire buttons for all adjustments, which are plentiful. It takes a bit of effort to memorize all the functions, but not long if you put the time in. The display area is nice and bright LED screen that displays voltage, wattage, remaining battery life, and atomizer resistance, among others. Before long I was zipping through the functions like a pro. Battery Life – Note* The Innokin SVD “kit” doesn’t come with batteries or a charger. Although you can stack batteries in this unit I don’t recommend it. It’s not specific to the SVD but rather my choice to never stack batteries in any electronic device that gets this close to my face. The battery life is pretty much what you can expect of any APV with these specs. The 18650 batteries will deliver an entire day of heavy vaping, with the medium and small battery 65-70% and 50% less respectively. Like others in the same range your battery life is going to be determined more on the frequency and power of your vaping that anything else. I like Panasonic batteries and in this review that is what I used for my 18650 choices. (Button Top or Flat Top) Battery capacity runs from 900mah, 1800mah, and 2600mah. My charging times were between an hour and half for the 18350’s and up to 6+ hours for the 18650 Panasonics. Safety Features: The SVD has plenty of safety features, including automatic shutoff when it detects a short circuit. Features also include reverse battery detection (a must for someone like myself), battery voltage detection, resistive load detection, aka, ohms meter, on/off battery switch (love that! ), low voltage warning (1.2v) a warning for something called “Overtime Vaping”. And one other feature I’d like to mention, which isn’t exactly a safety feature, but it should be noted that you could swap out batteries and whatever setting you have will be maintained. 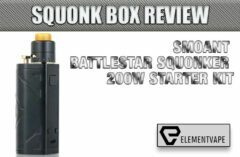 The feature isn’t exclusive to the SVD or Innokin, but it is worth mentioning. Overall Compatibility – Before I get to my real world impressions using the SVD let’s go over compatibility of the SVD with other devices. Like other 510/eGo or even 808/eGo, compatibility for eLiquid delivery attachments is outstanding. With respect to Innokin attachments you can use the iClear 10, iClear 16, and of course the iClear 30. In addition it can utilize CE4, CE5 clearomizers, Kanger T2, T3, MT3, Vivi Nova, and other 510 or eGo devices. Throw on a 510 to 808 adapter and there’s virtually nothing you can attach to it, not that I’ve seen anyway. It’s getting harder to differentiate between the modern APV’s on the market except they all take on a different physical appearances of course, but feature for feature all of the top end APV’s are going to be ‘feature-set’ until another major breakthrough happens and they all go through their upgrade paths and adopt it. 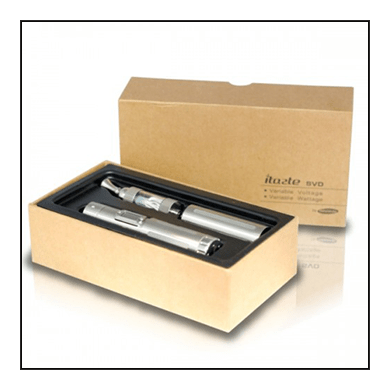 So, in that respect, the iTaste SVD is right up there with the best of them, using all the latest features to its best advantage. Although I prefer the way the VAMO handles different battery lengths (removable sections that stay flush) I can’t say that the telescopic fashion of the SVD is a bother. It’s not. It felt fine. The SVD is really no heavier than the VAMO with the 18650 batteries so while its not the lightest in its class (that would be the eVic) it’s hefty but feels nice and solid. Going through the various functions were fast, fluid, and easy. Checking the ohms of the clearomizer was very fast, and accurate. Hooking up various clearomizers and tanks I used during the review each one showed the same ohm readings on the SVD and the fluke meter. That said, for the most part I used other eLiquid delivery attachments (shouldn’t there be a nice, short name for all these things?) including a ProTank, Vivi Nova, Texas Tuff Tank, SmokTech Screw Tank, cartomizers by themselves and a few other devices I had laying about. My best vape came from using, surprise, the Texas Tuff Tank. I know I’ve mentioned it before, but man it don’t get much better a Tuff Tank. Running up and down the voltage and wattage settings produced expected results, and the Tuff Tank, with a 3.0ohm double-punched SR cartomizer allowed for wicked 4.9v-5.1v vaping. So, with the high-end feature set being something that is now across all the 2013 high-end devices the best way to judge whether or not the SVD is the one you want, or not, is to consider personal preferences a bit more than usual. Do you like the “look” of the device? Is the weight too much, just right, not heavy enough? The battery connector, 510/eGo or 808/eGo… which one is right for you? Does it matter if you’ll need to buy batteries and a charger for it? Most importantly, and specific to the SVD, what are your thoughts on the iClear 30? All the features you need to provide a great vaping experience are there. All the safety features you could ever want are there. So it can’t be about that, it has to be aesthetic, and it has to be based partly on the iClear 30. On the merits the Innokin iTaste SVD is a damn fine APV. Using it was a real pleasure, even with the iClear 30, it was accurate with the readouts, it never caused any errors, and I have zero complaints about it. On a scale of 1-10, 10 being the best damn APV I’ve ever seen and 1 being, oh, I don’t know, a V2 mini-ecig battery and their V2 Red prefilled cartomizer, I’d place the SVD at 8-5 to 9. I wouldn’t give up my purple ProVari v2.5 for it, or my eVic for that matter. But other than those two… yea, I’d trade for it. Perhaps the biggest “tell” for how much I appreciated the SVD is this; my usual review process starts with how much time I am willing to spend with the product I’m reviewing. There is always a minimum time requirement that is just long enough to give me the insight into how it feels to own the product. To make sure I know what its like to own it I use exclusively for the entire time. When it’s over I clean it up and put it back in the box and go back to my personal APV’s. This time, well, I haven’t put it back yet and the review period ended on Sunday. Buying Advice – Mountain Oak Vapors – The selling price, everywhere I’ve seen it, is $99.99, so our great friends at Mountain Oak Vapors are selling it at the same price as hardware vendors. Is there an advantage to picking this up at Mountain Oak Vapors instead of anywhere else? Yes, I think so. You’ll pay the same price as anywhere else. You can shop for great eLiquid while you’re there, and you know there’s nowhere else to pick up White Leaf, Cinnamon Swirl, Blue Drop, Red Drop, Pendragon, Sunday Morning, Carmelo, and on and on… but the most important reason? Because I’ve been buying eLiquids from these guys for a year and not once, not ever, has my order shipped late or shipped wrong. Never once have my eLiquid arrived in anything other than perfect shape, and their customer service is fast, friendly, and bend over backward to make sure your experience with them is first rate. Not to mention that as we “go to press” with this review they have 33 iTaste SVD’s in stock. So, you know, if you’ve been looking for one and everybody else seemed to be sold out and awaiting for the long ships from China to arrive, you can have one in a couple of days. Next : Hurricane Vapor e Liquid Video Review!